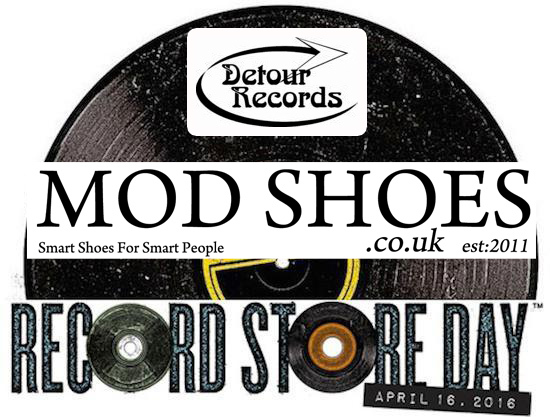 Modshoes & Detour Records – Record Store Day – Collectors item to be won ! You may not know it, but Saturday April 16th 2016 is Record Store Day here in the UK. The day is an annual event, and has been running for 9 years. Lots of artists put out Vinyl you can only get on the day. And it helps lots of indie shops & record companies get their stuff out there. I always try to get along and find something, last year it was a Georgie Fame EP. Anyways, this year we have teamed up with Detour Records, who as many of you know are predominantly a Mod / New Wave label. So we have a selection of vinyl singles from Detour records,one of which will be randomly given away with all orders whilst stocks last. And, this is the good bit, 1 lucky person will receive a collectors item record worth £20! So, as they say, you got to be in it to win it.